Asia's richest man is the latest to cozy up to Donald Trump with the promise of creating more American jobs. 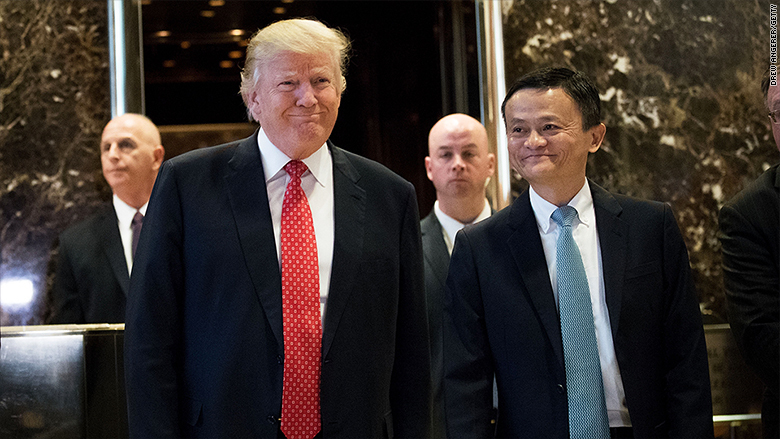 Jack Ma, the billionaire founder and executive chairman of the Alibaba Group (BABA), met with Trump on Monday to tease plans for creating "one million" jobs in the U.S. through the company's e-commerce platform. 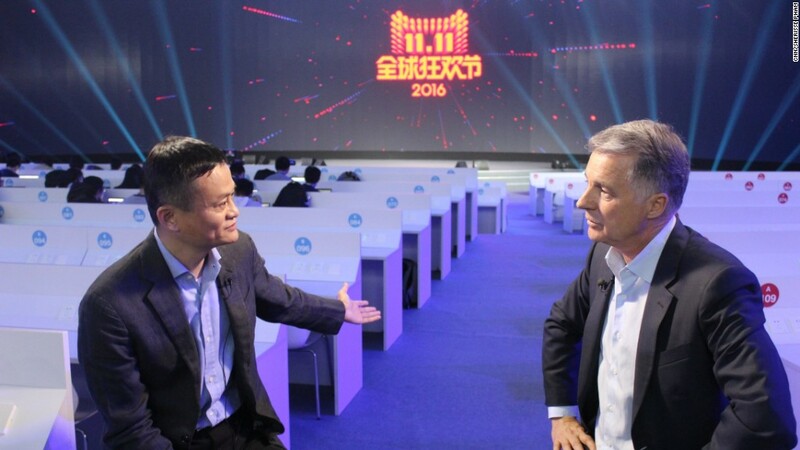 "Jack plans to share how Alibaba will create 1 million U.S. jobs by enabling 1 million small businesses to sell American goods to China and Asian consumers on the Alibaba platform," Brion Tingler, head of external affairs at Alibaba, said in a statement provided to CNNMoney. Trump praised Ma after the meeting as a "great, great entrepreneur and one of the best in the world." "We had a great meeting," Trump told the press pool at Trump Tower. "It's jobs. You just saw what happened with Fiat where they're going to build a massive plant ... in Michigan. And we're very happy. And Jack and I are going to do some great things." "I love China and I love America," Ma told reporters. However, details of the Alibaba plan remain vague. Ma has previously talked about his goal of getting American businesses to embrace the Chinese online shopping service. "We want to help U.S. entrepreneurs, small business owners, and brands and companies of all sizes sell their goods to the growing Chinese consumer class," Ma wrote in a 2015 op-ed. "Chinese consumers will get to buy the American products they want. This, in turn, will help create American jobs and increase U.S. exports." Alibaba stock was up 1.5% in early trading Monday following news of the meeting. The meeting comes amid mounting concerns in China over the incoming administration's overtures to Taiwan and Trump repeatedly bashing the country as a currency manipulator. Ma, known for being a savvy political operator in China and abroad, was more reserved than other tech executives in commenting on Trump in recent months. "He's a smart person, he will adjust," Ma said in an interview last year with CNNMoney about Trump. "He will never neglect the relationship between China and America." The jobs announcement may help improve Alibaba's relationship with U.S. regulators. The U.S. Trade Representative criticized one of the company's shopping sites last month for having an "unacceptably high" level of fake goods. "Unfortunately, the USTR's decision leads us to question whether the USTR acted based on the actual facts or was influenced by the current political climate," the company said in a statement about the trade report. Ma isn't the first billionaire entrepreneur in Asia to appeal to Trump with jobs. Masayoshi Son, the Softbank founder and an early investor in Alibaba, met with Trump in early December to announce a plan to create 50,000 jobs in the U.S. through a $50 billion investment. "Masa said he would never do this had we (Trump) not won the election!" Trump tweeted after the meeting. It later came out that the money was part of a previously announced $100 billion technology investment fund, much of which would likely have been directed at the U.S. regardless of the election outcome.